M&R Construction Group was given the opportunity to revitalize a section of this Queens neighborhood’s main commercial thoroughfare, 160-08 Jamaica Avenue. Our client, United American Land, sought to combine three very distinct buildings to create the four-story Jamaica Mall, a dynamic 150,000 sq. ft. structure to house the building’s tenants, each of whom had their own unique specifications for their particular space. Any project of this magnitude presents its own set of intricacies, and we thrive on the opportunity to come up with innovative solutions to even the most complex building challenges. In this case, the challenges that each building posed were as distinct as the individual buildings themselves. 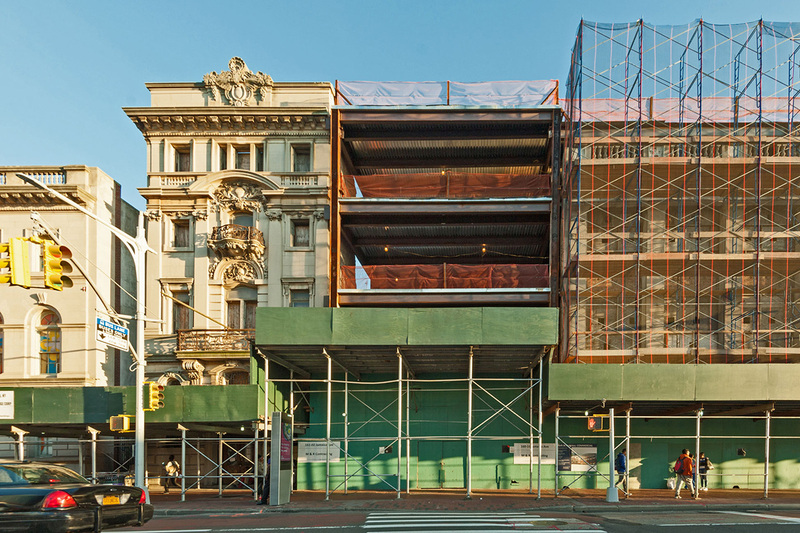 One, a 10-story building, had to be demolished, while the third building at 161-02 Jamaica Avenue, was a historic landmark which represented the largest opportunity for innovative thinking and creative problem solving. Constructed in 1897-98 to house Jamaica Savings Bank, the oldest and most prestigious banking institution in Jamaica, the four-story building had been designated three times as a New York landmark. The striking façade of the building was one of the few examples throughout Queens of the classically-inspired Beaux-Arts architectural aesthetic. We would need to follow an inventive strategy for delivering a modern and dynamic complex to our client and its tenants while maintaining and protecting this building’s rich architectural pedigree. Additional challenges came from the location of the project itself. The highly-trafficked retail thoroughfare made it logistically difficult to get the necessary equipment on-site. Heavy equipment could be situated on the street for limited off peak hours which made it difficult for work to get done. As a result, the necessary equipment had to be placed inside the building working in limited spaces and with a much higher risk for workers and accidents. In order to deliver the highly differentiated complex that our client envisioned, our skilled team devised a strategy that would require major demolition, gut renovation and landmark restoration. We devised a plan to divide the project into phases to allow for the limitations on the equipment’s mobility. This pushed us to demolish ten stories from one of the site’s main structures and to create an exterior curtain to perform the gut rehabilitation. To support the walls during the construction phase, we have built an interior steel frame. We feel that preserving the beauty of New York’s historic architecture is vital. For the restoration portion of this project, we devised and implemented a plan to protect the building’s history while utilizing the most modern technologies and construction solutions to make our client’s vision a reality. We have taken meticulous care to preserve the heritage value and character of the landmark structure’s exterior façade, while renovating the interior to integrate the cutting-edge design reflective of the overall concept for the project. As is the case with many of our projects, we have worked directly with several of our client’s tenants, including H&M, TJ Maxx and Burlington Coat Factory, to meet the unique demands of their brand and their retail needs. This project showcases not only our penchant for complex constructions but also our knack for marrying the old with the new, for seamlessly blending the historic and timeless with the innovations of modern construction.